Depending on the state, notary publics have a long list of transactions they are authorized to perform. One of the most common notarial acts a notary may be asked to perform is an acknowledgment. When performing an acknowledgment, a notary must confirm the identity of the signature on the document. Contrary to popular belief, the document does not have to be signed when the notary is present. Some states require notaries to document the confirmation of identity on the document itself. If the pre-determined verbiage is not pre-printed on the document, you may have to hand write it all which can be time consuming. We created the Notary Acknowledgment Rubber stamp to keep you looking prepared and professional when performing an acknowledgment transaction. Unsure if this stamp is permitted in your state or will work for your notarial duties? Contact us! 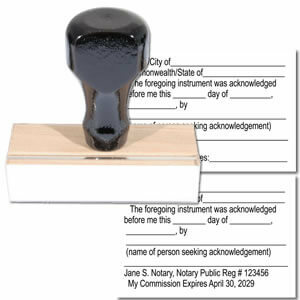 The Notary Acknowledgment Rubber stamp is a great durable stamp to add to your box of tools. The Notary Acknowledgment Rubber stamp does require the use of an additional ink pad but is very economical. The Notary Acknowledgment Rubber stamp can be used almost indefinitely as long as you keep your additional ink pad from drying out. Each Notary Acknowledgment Rubber stamp is made of 100% American-made materials and is assembled in-house by our talented and detail-oriented team. The Notary Acknowledgment Rubber stamp is not meant to be used as your notary seal. This is a supplemental stamp only.